It is common to hear of auto loan options for people with bad credit scores, but it's less likely with car repossession on your credit report. Repossession that has occurred within 12 months of applying for an auto loan can place handicaps on the loan process. Many consumers don't consider this when financing a vehicle, and only find out how bad repossessions damage credit later, but this does not have to happen to you. We know how repossessed autos impact credit and loan chances for you in the future. In most cases when we think about someone's property being repossessed we tend to equate that with them defaulting on their bad credit auto loan and the lender taking that property back. However, this is only one form of repossession as there is also voluntary repossession, which is when an owner decides to return a vehicle to the lender if they don't feel like they can manage their finance payments. The only similarity that can be found with these types of repossession is that they both make it more difficult to finance bad credit vehicle loans later in life. 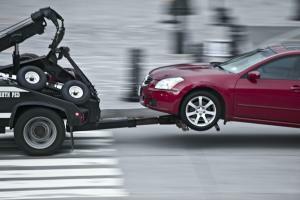 Why Does Repo Cause Credit Problems? Lingering Debt: After becoming a repo victim your credit report will highlight your repossession as an act that occurred due to you failing to meet your payment obligations. This information will remain on your report as lingering debt that you are responsible for paying off, even if the lender sells the car to someone else. Borrowers Court: On occasion if a person does not repay the lender following a repossession they can be taken to borrowers court. A ruling that results in the dealer winning can prove to be even more disastrous as this will also make its way to one of the major credit bureaus and onto your credit report. Trying to qualify for auto financing with repossession on your credit history report will cause lender to question your income, ability to make timely payments, as well as how responsible you are as a consumer. To make things worse, the effects of car repossession can remain on your credit for nearly 10 years making this a bigger credit problem for you. However, with the help of good damaged credit repair tactics and possibly a local sub prime auto lending dealer you could begin to slowly improve your credit status, and eventually get the loan you need. Here at AutoNet Financial we help provide useful information for people who want to learn about bad credit repair companies. We also work with local car dealerships and in house financing dealers to make it easier to find the best auto loans that accept people with problem credit.